The Qlik Sense WordPress plugin allows the easy addition of Qlik Sense objects (charts, tables, toolbar, etc) to WordPress posts and pages. It was originally created by Yianni Ververis of Qlik and has been contributed to and improved by others, including myself. 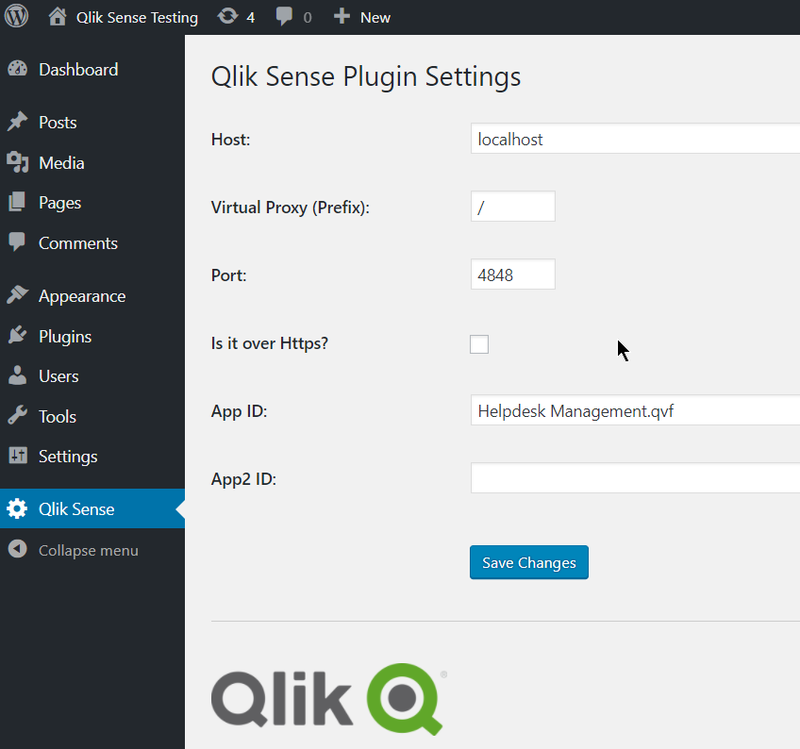 In the search box towards the right hand side, type "Qlik Sense" and hit enter to search. The Qlik Sense plugin is currently one of only two results returned (the other being my Qlik for WordPress syntax highlighting plugin). Click the "Install Now" button next to it. WordPress will then download and install the plugin for you. Once complete, click the "Activate Plugin" link to complete the installation. The plugin is now installed and ready to be configured. 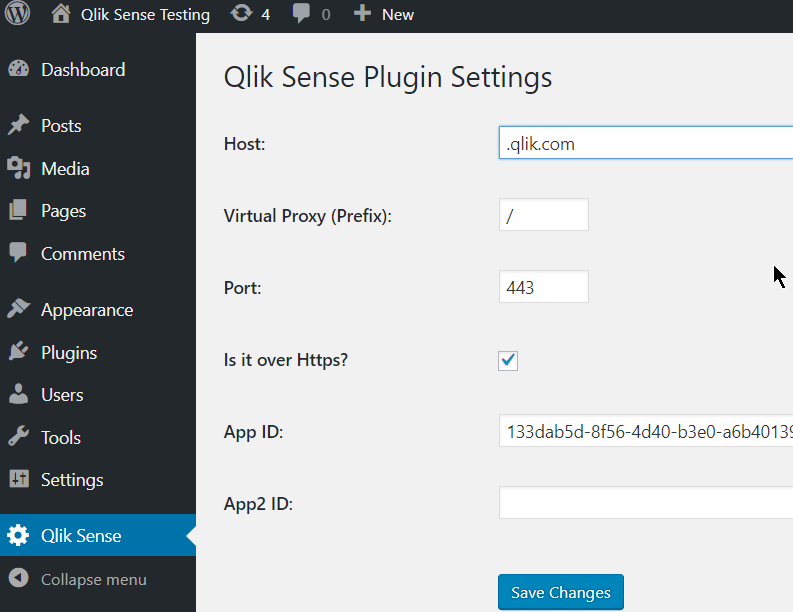 Assuming you have used the above installation method, like other WordPress plugins, you will be notified when a new version of the Qlik Sense plugin is available. Follow the prompts within the notification to upgrade to the latest stable release. On the left hand navigation panel, select "Qlik Sense". 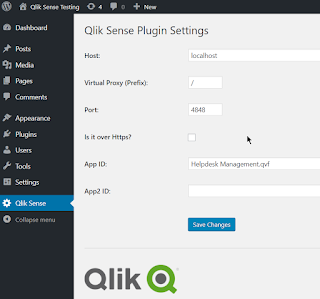 The plugin utilizes a WordPress shortcode to insert Qlik Sense objects into a post or page. There are currently 3 shortcodes available to insert Qlik Sense objects, a clear selections button or the Qlik Sense selections toolbar. The shortcodes can be added manually as detailed below or alternatively, the shortcodes can be generated and inserted using the buttons provided within the WordPress text or visual post/page editor. In the text editor, place the cursor in the post/page where you wish to insert the object, then click the relevant Qlik Sense button on the editor menu. You You may be prompted to enter required parameters for the shortcode. Once complete, the shortcode will be added to the post or page. height="": The height of the visualization in pixels. nointeraction="true" (optional): Add this if you want to disable interactions. If you want the objects to have interaction, you can just omit this. appid="" (optional): The variable qs_appid is added to store the value from the custom field appid. The custom field is used to be able to use a separate app for each page rather than the apps defined in the plugin config. This shortcode allows you to ebmed a Clear Selections button. This shortcode allows you to add the Qlik Sense selections toolbar to the post or page.